ستاری, حمید, غلامی, علی, سیاه‌کوهی, حمید رضا. (1392). تبدیل فوریۀ زمان‌کوتاه برمبنای تنکی و کاربرد آن در تشخیص لایه‏های نازک. 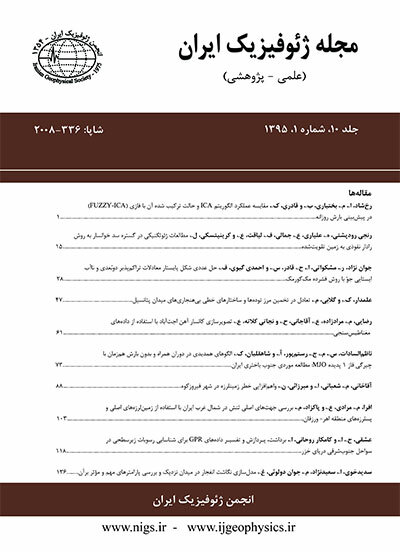 مجله ژئوفیزیک ایران, 7(3), 36-48. حمید ستاری; علی غلامی; حمید رضا سیاه‌کوهی. "تبدیل فوریۀ زمان‌کوتاه برمبنای تنکی و کاربرد آن در تشخیص لایه‏های نازک". مجله ژئوفیزیک ایران, 7, 3, 1392, 36-48. ستاری, حمید, غلامی, علی, سیاه‌کوهی, حمید رضا. (1392). 'تبدیل فوریۀ زمان‌کوتاه برمبنای تنکی و کاربرد آن در تشخیص لایه‏های نازک', مجله ژئوفیزیک ایران, 7(3), pp. 36-48. ستاری, حمید, غلامی, علی, سیاه‌کوهی, حمید رضا. تبدیل فوریۀ زمان‌کوتاه برمبنای تنکی و کاربرد آن در تشخیص لایه‏های نازک. مجله ژئوفیزیک ایران, 1392; 7(3): 36-48. تجزیۀ طیفی نقش مهمی در پردازش و تفسیر سیگنال‏های لرزه‏ای دارد به‌طوری‌که از آن درحکم یکی از نشانگرهای پس از برانبارش در اکتشاف ذخایر هیدروکربنی استفاده‏های زیادی می‏شود. هرچه تفکیک‌‌پذیری تبدیل زمان‌بسامد مورد استفاده در تجزیۀ طیفی بیشتر باشد، نتایج به‌دست آمده مطلوب‌‌تر خواهد بود و به همین دلیل، محققان گوناگون در زمینۀ پردازش سیگنال همواره در پی عرضة تبدیل‏های بهتر یا بهینه‌سازی تبدیل‏های قبلی هستند. به دنبال الگوریتمی که غلامی و همکاران (2010) برای تجزیۀ سریع زمان‌بسامد بر مبنای تنکی عرضه کردند، در این مقاله یک قید تنکی دیگر برای بهینه‌سازی لحظه‏ای به آن اضافه شده است که سبب می‏شود نقشۀ زمان‌بسامد حاصل، قابلیت تطابق بیشتری با تغییرات محلی سیگنال داشته باشد. از تطابق ایجاد شده می‏توان در مقاصد تفسیری و پردازشی بهره گرفت. برای نشان دادن توانمندی این بهینه‌سازی، تبدیل حاصل برای تجزیۀ طیفی چندین دادۀ مصنوعی و نیز یک نمونه دادۀ واقعی با هدف تفکیک لایه‏های نازک مورد استفاده قرار گرفته است. Time-frequency analysis plays an important role in seismic data processing and interpretations. In seismic exploration, the process is called spectral decomposition and refers to any method which produces a continuous time–frequency representation of the seismic trace. It is widely used as one of the most important post-stack attributes in hydrocarbon detection. Since spectral decomposition is a non-unique process, a single seismic trace can produce various time-frequency representations. This can be done using a variety of time-frequency methods that generate a time-frequency map of a signal. These methods include the STFT (Short-Time Fourier Transform), ST (S-Transform), CWT (Continuous Wavelet Transform), WVD (Wigner-Vile Distribution), MPD (Matching Pursuit Decomposition) and etc. Each method has its own advantages and disadvantages and different applications require different methods, but the important point is that the more resolution has the time-frequency transform, the more reliable the results will be. Therefore, the researchers in the field of the signal processing are always seeking more robust transforms or optimization of the previous ones. The short-time Fourier transform is an efficient tool to display the energy distribution of the real world signals over the time-frequency plane but due to the over completeness of Gabor functions, there are more than one set of time-frequency coefficients that represent the data. Therefore, it is a good approach to consider the decomposition as an inverse problem. By doing so, additional constraints can be applied to the decomposition to generate a time-frequency plane having desired properties. Decomposition with a sparsity constraint is a suitable strategy which enables selecting a small number of elementary functions such that a linear combination of them fit in the given data. Portiniaguine and Costagna (2004) compared the performance of the sparsity-based decomposition with that of the classical non-sparse approach for seismic data. Although the resolution of sparsity approach was much better, it computationally demanded much time and effort. Thereafter, a fast algorithm for Sparse Time-Frequency Decomposition was presented by Gholami et.al (2010) based on the Bregman iteration (Goldstain and Osher, 2008) which provided the time-frequency representation of the signal with profoundly high resolution in a satisfactory calculation time. In this study, another sparsity constraint has been supplemented for instantaneous optimization. The extra sparsity constraint makes the time-frequency plane more adaptive to the local changes of the signal while it does not affect the speed of the fast sparse time-frequency algorithm significantly. The final optimized transform is a good tool for decomposition of non-stationary seismic signals having dramatically different frequency components. Applications of the time-dependent optimization are developed to promote seismic data processing and interpretations. For example, by means of the high sensitivity of the resulted transform to seismic wavelet interference, it is shown that thin bed layers are characterized very easily. In order to highlight the efficiency of the proposed optimization, the final optimized fast-sparse time-frequency transform is used for decomposition of real and synthetic seismic data. This is while the interpretational purpose of thin bed detection is considered. Castagna, J., and Sun, S., 2006, Comparison of spectral decomposition methods: First Break, 24, 75-79. Castagna, J., Sun, S., and Siegfried, R., 2003, Instantaneous spectral analysis: Detection of low-frequency shadows associated with hydrocarbons: The Leading Edge, 22, 120-127. Chuang, H., Lawton, D, 1995, Frequency characteristics of seismic reflections of thon beds: Journal of Exploration Geophysics, 31, 32- 37. Donoho, D. L., 2006, For most large underdetermined systems of linear equations, the minimal l1 solution is also the sparsest solution: Communications on Pure and Applied Mathematics, 59, 907 - 934. Gholami, A., Amini, N., Siahkoohi, H. R., and Edalat, A., 2010, Fast-sparse time-frequency decomposition: 72nd EAEG meeting, Madrid, Extended Abstracts. Goldstein T., and Osher, S., 2009, The split Bregman method for L1 regularized problems: SIAM J. Imaging Sci., 2(2), 323–343. liu, J., and Marfurt, K., 2006, Thin bed thickness prediction using instantaneous frequency: 76th SEG meeting, New Orleans, Expanded Abstracts, 968–972. Jones, D., and Baraniuk, G., 1994, A simple scheme for adapting time-frequency representation: IEEE Trans., 42(12), 3530-3535. Marfurt, K. J., and Kirlin, R. L., 2001, Narrow-band spectral analysis and thin-bed tuning: Geophysics, 66, 1274-1283. Portniaguine, O., and Castagna, J. P., 2004, Inverse spectral decomposition: 74th SEG Meeting, Denver, Expanded Abstracts, 1786-1789. Partyka, G., Gridley, J., and lopez, J., 1999, Interpretational applications of spectral decomposition in reservoir characterization: The Leading Edge, 18(3), 353- 360. Sheriff, R., and Geldart, l., 1995, Exploration Seismology: Cambridge University Press. Sinha, S., Routh, P. S., Anno, P. D., and Castagna, J. P., 2005, Spectral decomposition of seismic data with continuous-wavelet transform: Geophysics, 70, 19-25.